You are here: Home / Business / What Kind of Company Do You Work For? “…LeadershipIQ, a Washington, D.C.-based consulting firm, identified four distinct workplace cultures, defined as the way an organization functions internally, in everything from communication to decision-making to how it handles promotions: “Hierarchical” companies are built on tradition and rely on clearly defined roles; “dependable” companies are process-oriented, where change happens slowly; “enterprising” companies are creative, competitive and meritocratic; “social” companies emphasize collaboration, trust and relationships. Turns out, employees engage differently in different workplace cultures, too. LeadershipIQ had expected to find that employees would be most excited about being in a social environment where everyone gets along… Not so. Enterprising cultures fostered the highest levels of employee engagement—the degree to which employees give 100% effort and recommend their firm as a great place to work. On a seven-point scale, engagement at enterprising firms was rated 5.1. At social companies, the engagement score was 4.8. Dependable firms came in at 4.6, and hierarchical companies had engagement scores of only 3.9. In total, most executives surveyed (1,463 total drawn from U.S. companies) said their work forces were under-engaged (43%) or disengaged (10%). 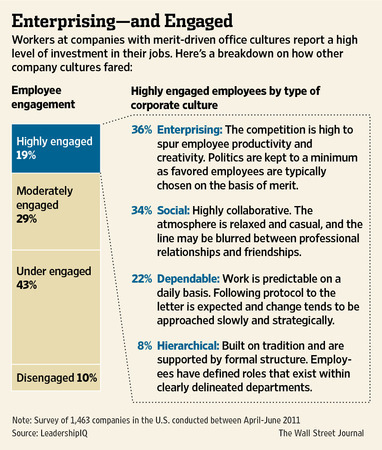 Of those who said their employees were disengaged, the majority (52%) were at hierarchical firms. LeadershipIQ also found that hiring an employee at any level—from CEO to rank-and-file—who doesn’t fit into a firm’s culture can spell disaster. For example, a lawyer who is risk-averse and thrives on rules might loathe working in the legal office of an enterprising firm that values new ideas and creativity. Hi David. Your posts are so inspiring and informative. I simply want to send everyone I know every post you create. Thanks for sharing your gift of knowledge and questions. David, very informative piece, and something to think about – especially the last point about hiring people who do not fit into a firm’s culture.